Hello. 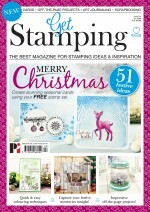 The latest issue of Get Stamping is on the shelves now. It's packed full of festive ideas and comes with a great cover gift - a huge set of seasonal stamps. For my article I got to play with some cool Jofy stamps and Caran d'Ache water soluble crayons. OK guys, you know the drill. Move this magazine to the front!